Let’s admit it. Permaculture’s design principle which suggests our designs fulfil more than one purpose is a good idea. It is the good idea that stimulated permaculture-trained architect, Terry Bail, from Archology, to turn the new entryway sign at Randwick Community Centre into a multipurpose installation that catches and infiltrates rainwater at the same time it directs people to different parts of the site and informs them of upcoming events. the adjacent Randwick Environment Park and its ephemeral wetland, a remnant of the Eastern Suburbs Banksia Scrub which once covered the region. On a site with a number physical components spread over an area, links and continuity are important so people can find their way around. This is an important consideration in the design of public places. When interpretive signs and site maps are completed and installed in a few months, the entryway sign will fulfil one of its roles as a wayfinding device. It will link where people are to where they want to go. The noticeboard also displays posters for upcoming events. ‘Observe and interact’ is a design principle in permaculture. The decision to install the entryway signage came from the observation, in the form of comments, that people didn’t know where to go when they arrived at the site. If workshops or events were to be in the community centre building, the Classroom or in the shelter in the Permaculture Interpretive Garden, where would visitors find these? 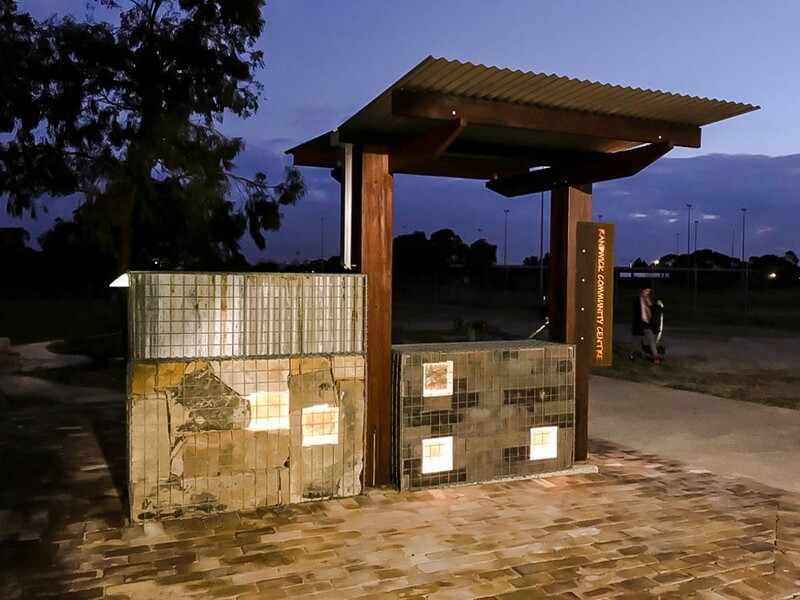 Situated at the end of the reused-brickwork-paving of the Meeting Place plaza, the sign structure is the first landscape design component encountered on entering the site from the car park. From the noticeboard installation, the walkway/cycleway takes visitors past a row of angophora trees to the entrances of the Randwick Community Centre building, then follows an avenue of olive trees to where it diverges one way towards the Classroom and the other way into the Permaculture Interpretive Garden. The walkway/cycleway continues past the garden to connect to residential streets. Continued the other way alongside the western edge of Munda Street Reserve, it becomes an informal foot track that follows the edge of the ephemeral wetland to link with residential streets on the Maroubra side. Some time in the future the track will probably be remade into a continuation of the walkway/cycleway. The noticeboard installation is a lot more than a direction-finding device. 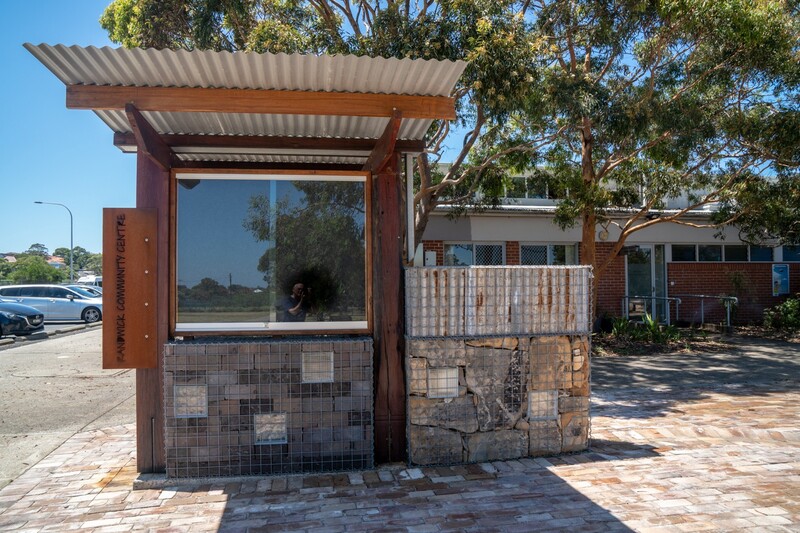 The wayfinding sign and noticeboard at the entrance to Randwick Community Centre in Sydney’s Eastern Suburbs is designed to assist visitors navigate the site and to harvest and infiltrate rainwater. The square shapes in the gabion are LED lighting triggered by a movement sensor. 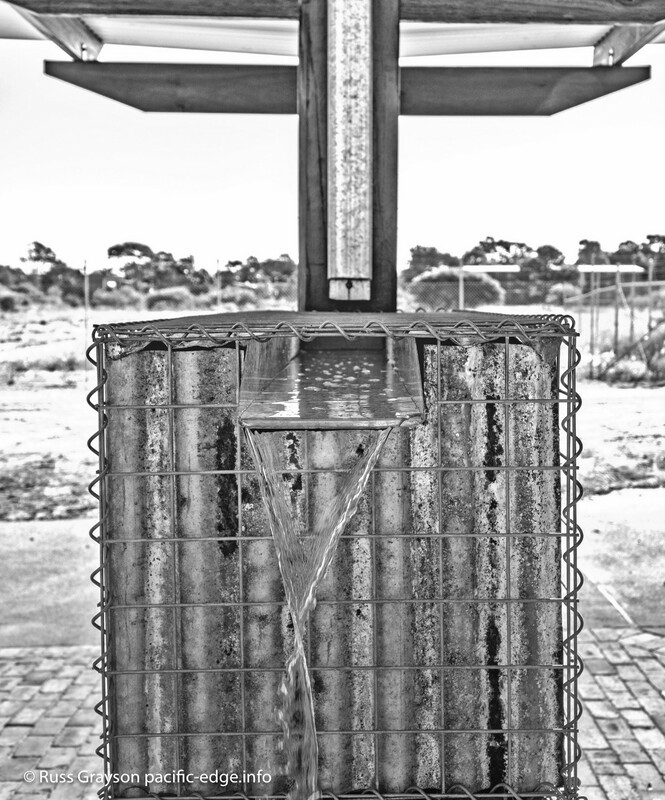 The use of reused timber, galvanised iron and stone blend the installation into its built and natural environment. That, or something very much like it, is one of the permaculture design principles devised by permaculture co-inventor, David Holmren. So too is co-inventor, Bill Mollison’s permaculture principle of designing for multifunction. At the noticeboard installation, the resource that is caught is rainfall. Spilling from the downpipe, runoff flows along a channel atop the gabion then cascades into a dish drain in the recycled brick paving. From there is flows into the soak and into the soil. The roof is key to how the noticeboard accomplishes this design principle of harvesting resources where they occur. Sloping inwards to a central channel, rainfall flows into a downpipe that spills into a near-horizonal channel in the rock-filled gabion. Running along the length of the gabion, the runoff cascades into a shallow dish drain in the recycled-brickwork paving. Seen in action during heavy rain, it is a somewhat dramatic performance by the runoff and brings attention to the need to make best use of rainfall in this often-dry climate. Gravity pulls the water along the drain and into a sandy soak where, when there is sufficient rain, it temporarily pools before infiltrating the soil into the aquifer, the underground store of fresh water. Water temporarily pools in the soak before being absorbed into the free-draining sandy soil. The rocks in the soak reinforce its sandy base against scouring by fast-moving water. The large sandstone block beside the soak serves as a seat shaded by adjacent trees. 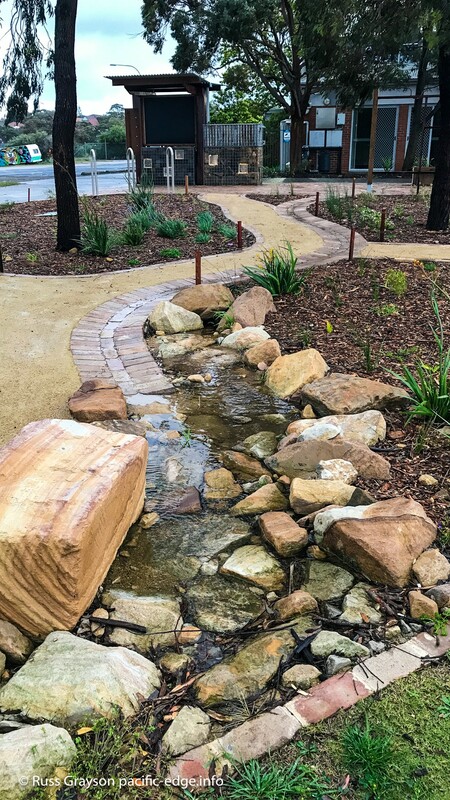 The soak is part of the landscaping through which pathways take visitors to nearby seating as well as to the open space of Munda Street Reserve beyond. The newly-established plants are mostly Australian natives. The choice was driven by the need for species that can thrive in the nutrient-deficient sandy soils, the harsh and hot summer sun and winter’s blustery and cold south-westerly winds. Low-maintenance was another factor in plant choice. Roofed in the classic Australian building material, galvanised iron, and with timber posts of reused hardwood, LED lighting has been installed within the gabion. Notices are attached behind locked, armoured glass panels and are illuminated at night. ‘Randwick Community Centre’ was cut-out out of the iron sign on the side of the installation and is illuminated by LED lighting within. The sign has a rusty finish to visually blend with the galvanised iron and stone of the installation. 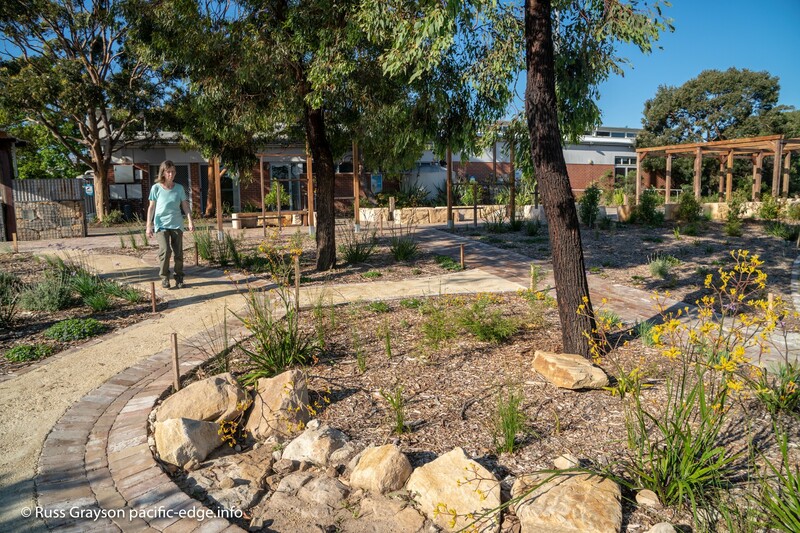 Established for only a few months, the plants in the landscaping will eventually provide a fuller cover and become a resource for the nearby native and honey bee hives maintained by Sydney Bee Club, as well as for insects and small birds. It is a design criteria of any noticeboard that it is prominently placed where it catches the eye, visually complements its built and natural environment and is aesthetically pleasing. The noticeboard accomplished this through its placement at the entrance to the community centre and through the choice of reused timber, iron and stones. The view past the notice board is to the Meeting Place plaza and pergola, designed as spill-out space for workshops and events in the community centre building as well as a place to sit when waiting for workshops and events to start. 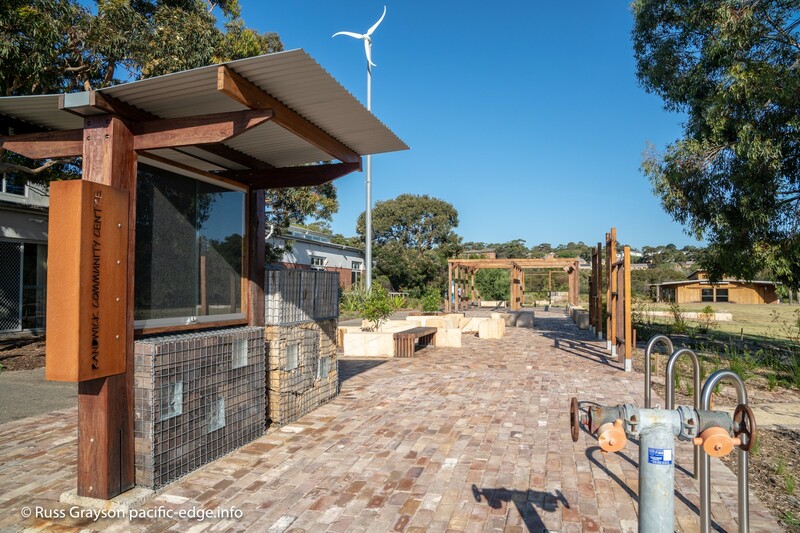 The olive avenue beyond the Meeting Place leads to the Permaculture Interpretive Garden and the Classroom, a structure used for council’s community resilience education program and the pre-and-primary schools introductory science program. The Classroom, seen in the distance at right, reuses recycled building material. As a component of a site in which permaculture design and education plays a significant role, it should not be surprising that the noticeboard installation demonstrates the application of a number of the principles of permacultue design. 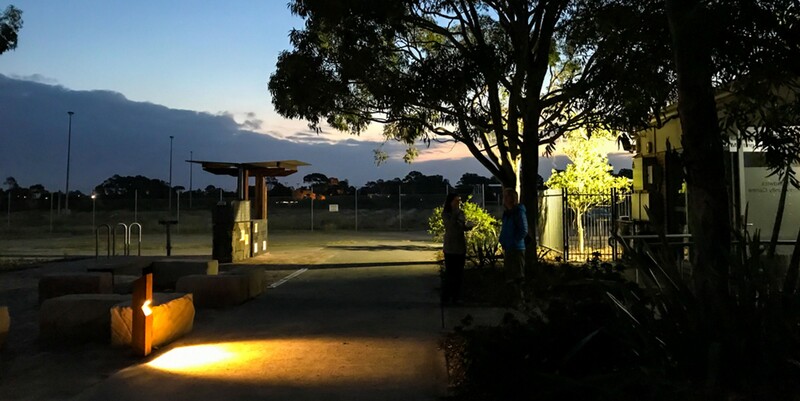 Observe and interact: The observation that people found difficulty in navigating the Randwick Sustainability Hub site led to the idea to install wayfinding signage. Catch and store energy: The structure was designed to be multifunctional and include rainwater harvesting. That is the ‘energy’ (better described as ‘materials’ or ‘resources’) captured and stored in the sandy soil profile. Obtain a yield: Rainwater is one of the yields obtained, along with information for site navigation. Apply self-regulation and accept feedback: Feedback came in the form of people saying that it was difficult finding locations on-site. The noticeboard installation was a response to this. Self-regulation in the form of minor modifications and the design of new features follow observation made over time of how people move through and use the entire site as well as comments they make. Use and value renewable resources and services: This is accomplished through harvesting the renewable resource of rainfall and in the habitat value of the landscaping adjacent to the noticeboard installation. Produce no waste: The choice of durable, long-life and recyclable materials for the structure accomplished this principle. Design from patterns to details: The pattern is that of pedestrian circulation around the site. The detail is the noticeboard installation. Integrate rather than segregate: Integration comes through signage directing people around the site. Visual integration comes through the use of materials repeated through the entire site which produce a particular ‘feel’, an ambience. Use and value diversity: Adjacent landscaping, mainly but not exclusively Australian plants adapted to dry soils, summer heat and the strong, cold winds of winter consists of diverse species. Use edges and value the marginal: The edge is the path where buildings, car park and open space meet. As part of the Meeting Place plaza the installation provides a more-useable edge than previously existed. Creatively use and respond to change: As cities become more-densely populated, and with the construction of the neighbouring residential precinct in the 1990s, new demands were brought to bear on the Munda Street Reserve that brought the construction of the community centre buildings and, later, the Randwick Sustainability Hub. The courses and workshops forming part of the Hub were one of the site uses identified in the initial community participation planning process when the community centre was opened. They continue due to continuing community participation and demand. Use small and slow solutions: This was not a relevant design consideration because the installation was constructed at the same time as the Meeting Place plaza. Construction costs and the project timeline made slow solutions impractical. The installation at night. LED lighting in the glass bricks is triggered by a movement sensor, as is lighting along the pathway beside the community centre building. This reduces energy use when lighting is not required when there are no people about. Another way to think of the design of the noticeboard installation is in terms of permaculture’s needs>functions>yields approach. public safety — design, materials and finishes are important criteria for public place design; a public place must be safe to visit — no sharp edges, trip or other hazards; paths and steps must comply with Australian Standards; main pathways must be of suitable gradient, material and finish to accommodate people with walking aids; cycleways must comply with Australian Standards and be sufficiently wide to accommodate bicycles and pedestrians. the primary purpose is that of wayfinding, directing people to the different parts and buildings on the site and notification of events and information; rainwater harvesting and infiltration of the soil profile by water is a function of the design, a secondary benefit. aquifer replenishment; in directing rainfall along the dish drain into the soak from where it infiltrates the soil profile into the aquifer below, soil water retention can be considered a yield of the design.